By 275 B.C. Celtic influence had spread to what is now England, Scotland, Ireland, Wales, France and Spain. The reason we associate Celts with Ireland, Scotland and Wales is that is where Celtic identity remained after Europe was dominated by the Roman Empire. Celtic revivals of cultural identity have come and gone and come again in those countries. “Celt” is a broad word that covers different peoples in different places and times. When I speak of “Celtic Christians,” I mean Christians living in Ireland, Scotland and Wales. efore Christian missionaries came to the Ireland, the Irish Celts were polytheistic (many gods) and animistic (belief of spirits in everything, people, plants, animals, trees, etc. ), which is the source of the idea that Druids (Celtic priests) worshiped trees. Christian missionaries came into Britain after Christianity was decreed a religio licita, a legal religion, and also the religion of the Roman Empire, with a peak of missionary activity in the fifth century. atrick is the first person we think of when Celtic Christianity is mentioned, mostly because he has his own holiday. But Patrick is much more than an excuse to drink green beer (yuck!) and eat corned beef and cabbage (delicious, but unknown to Patrick and to most of the Irish). 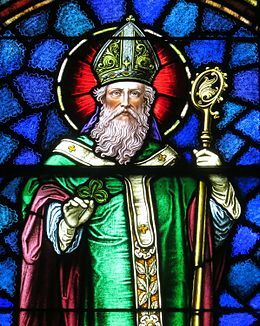 He is rightly called “the Apostle to the Irish.” He grew up as a Christian in Roman Britain, but as a teenager, he was not serious about his faith. At age 17 he was kidnapped by Irish pirates (who were more like our image of Vikings than Captain Jack Sparrow) and taken to Ireland as a slave, where he remained for six years. He escaped and eventually returned home to western Britain where he studied the Christian faith more seriously and was ordained a priest. Legend says that he had a vision of a man urging him to return to Ireland to bring the gospel. There are accounts of Patrick baptizing thousands of people, ordaining priests and setting up Christian communities in Ireland. It seems that he worked with the culture, a hostile and barbaric culture, and transformed it into a Christian culture. Human sacrifices and the glory of battle was replaced with the sacrifice of Christ and the glory of rising above our broken nature by the power of Christ. Like Augustine, Patrick wrote his Confession in which he described his early life and his return and growth in the Christian faith. rom the time of Patrick (d. ca. 460) until the Synod of Whitby in 664, the Celtic church was independent of the church of Rome but did not see itself as separate from it. This was also the golden age of Irish monasteries which were centers of faith and centers of learning, both sacred and secular. Missionaries were sent out, first back to Britain, Wales and Scotland, then to mainland Europe. Traveling monks established churches and monasteries. There was a difference between the Irish churches and the churches of Rome. The Irish calculated the date of Easter with a different formula—usually resulting in celebrating their Easter a week or two after Roman Easter. Irish monks had their own tonsure (either a wedge-shaped stripe was shaved over the top of the head from ear to ear, or the front of the head was shaved to a midline from ear to ear), while Roman monks had a coronal tonsure (like Friar Tuck with a wreath of hair around a bald dome). The Irish churches had their own rites with service outlines similar to the Roman mass and liturgies of hours, but with unique prayers. Celtic churches did have a veneration of saints, but it was mostly honor for deceased bishops and abbots, along with the biblical New Testament saints. Some of the prayers ask the saints, “Pray for us.” In pre-Whitby literature, Mary is mentioned as the mother of the Lord, but gets no special honor. After the Synod of Whitby, the Celtic churches in Ireland, Scotland, Wales and all their missions were ordered to calculate the date of Easter in the Roman manner, and to adopt the Roman tonsure and other worship practices. From that point, the Celtic church began to lose its distinctiveness from the church of Rome, although some unique practices and emphases continued. he mid-to-late 1800s was a time of tremendous scholarship, and because of that, it was a time of renewed interest in the early Celtic church. The Henry Bradshaw Society published scholarly editions of The Antiphonary of Bangor, The Lorrha-Stowe Missal, Liturgy and Ritual of the Celtic Church and other resources. At the same time, Alexander Carmichael was collecting Christian prayers, poems and even some pagan spells from Gaelic speaking people in Scotland. He was interested in the prayer and poetry from the Celtic folk traditions, and his work is published in the volumes of Carmina Gadelica. Kuno Meyer also collected, translated and published much old Irish literature, sacred and secular. As a result, there was a renewed interest in Celtic languages and attempts at revive their use and also much imitation the old literature from the 1880s to 1920s. There was also renewed interest in Celtic art. We seem to be in another Celtic revival. There are now many books on Celtic prayer and Celtic spirituality. Some of this seems to be a repristination movement—a desire to return to a simpler Christianity that is not separated from daily life with no conflict and more in tune with nature. But life for the early Celtic Christians was not always simple, peaceful or innocent. Read the loricas. The Celtic Christians of that time made long lists of things they wanted God’s protection from: the Red Plague, the Yellow Plague, marauders, thieves, nakedness, drought, famine. Read the penitential manuals (Celtic Spirituality, p. 227-245), and you will see that some of the Celtic Christians were doing shameful, wild and vulgar things they needed to confess and receive forgiveness for. They were Christian people, like us, who lived, worked, sweated and struggled through life, and they committed their cares to God in carefully worded, poetic prayers. The immanence or closeness of God. (“Christ with me, Christ before me, Christ behind me, Christ in me, …) In his Confession, Patrick rejects any kind of animism, polytheism or pantheism and confesses a biblical theology of God, very much like what is seen in the Nicene Creed (see The Creed in the Confession of St. Patrick and St. Patrick’s Creed). Yet he retains an emphasis of immanence or closeness to God, along with a sense of the presence of God in nature. God is not the same as his creation, but he is in it and with it (See Psalm 139). An understanding of prayer as tapping into God’s supernatural power. Some scholars see connections between the pagan Celtic charms and incantations and the Celtic Christian prayers for protection, yet the prayers for protection are completely in line with “Calling upon God’s name in the day of trouble” (Psalm 50:15) and “Putting on the full armor of God” (Ephesians 6:10). A love of lists. A prayer for protection from danger may ask for protection from every angle, protection for every part of the body, or protection from every evil imaginable. A confession of sin may ask for forgiveness of sins committed in different places, with different things or by different parts of the body and deliverance from temptation from many sources. A love of repetition. Repetition of the last line of a prayer is seen in many of the prayers of Carmina Gadelica and is seen in some of the old prayers, too. This seems to be done for emphasis, and to bring the prayer to a conclusion. The Carmina Gadelica (Songs of the Gaels, see Wikipedia) is a collection of Scottish Gaelic hymns and prayers collected in the mid 1800s. Volumes I and III contain Celtic Christian prayers. Volume II contains Celtic animistic spells and incantations. The initial capitals on this page are illustrations from The Carmina Gadelica. The Antiphonary of Bangor (Wikipedia) is an Irish liturgical text containing prayers and antiphons for the liturgy of hours (the daily offices or services in the monasteries). It was written around A. D. 680, and seems to present pre-Whitby rites and practices. The Lorrha-Stowe Missal (Wikipedia) is a post-Whitby book with materials for the performance of the Mass, probably written after A. D. 792. Even though it is post-Whitby, there are some prayers and practices that may be remnants of pre-Whitby rites. Some scholars also see traces of the worship of early Celtic Christians in the Mozarabic Rite (Wikipedia) (2000 Years of Prayer, ed. Michael Counsell, p. 84). The Book of Cerne (Wikipedia) is an illuminated manuscript, similar in artistic style to the Book of Kells, containing the Gospels, prayers, hymns, and other liturgical materials. It is really an Anglo-Saxon book, but it also shows Celtic / Irish influence in its art and texts.